Tommy Flanagan (piano, tracks 3-5), Doug Watkins (bass) Art Taylor (drums). For a variety of reasons the four musicians featured on Avid’s 2-CD anthology Jazz Trumpet (which might more accurately be titled ‘Modern Jazz Trumpet’) don’t have the kind of high reputation which their evident talents might have been expected to win for them. Two of them – Booker Little and Joe Gordon died young; Little, at the age of 23 from complications following uraemia, Gordon at the age of 35 in a house fire. The other two, Louis Smith and Johnny Coles were not, mercifully in light of the curse that seems to have struck so many young trumpeters (Clifford Brown being a prime example) cut off in their early prime. Smith (1931-2016) took two long breaks from playing to concentrate on teaching and in doing so lost both some of his sharpness as a performer and his place in the spotlight; Johnny Coles (1926-1997) was held in high regard by many of his fellow musicians – he worked and recorded extensively as a member (and occasionally a featured soloist) of ensembles led by, inter alia, Charles Mingus, Gil Evans, Herbie Hancock and Duke Ellington. However, he recorded only four albums under his own name. 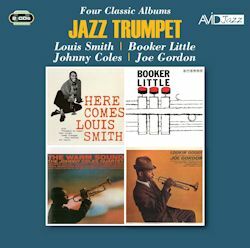 Here Comes Louis Smith was Smith’s first recording as a leader; the music was initially recorded for Transition, but that company was overtaken by financial difficulties before it could be issued and Blue Note took and issued the album. Leonard Feather’s original sleeve note, reproduced by Avid, refers to Smith as “an unknown trumpet player”. Deservedly, this first album was soon followed by a second, Smithville, also issued by Blue Note. Soon afterwards Smith decided to concentrate on a career in teaching, based at the University of Michigan. It was to be 20 years before he returned to a recording studio when, in the late 1970s he made two albums (Just Friends and Prancin’) for the Danish label Steeplechase. There followed another hiatus (in terms of recordings) of 11 years, before he made some further records for Steeplechase, beginning with Ballads for Lulu in 1990. He continued to play (and record) through the 1990s. While the 12 recordings he made for Steeplechase are interesting and worthwhile they largely lack the fire and intensity of his early Blue Note sessions. On those, as a young man, Smith was a musical risk taker (and most of the risks came off); the later recordings find him far more cautious and – the adjective can’t be avoided – ‘academic’. Self-confidence certainly wasn’t in short supply when he recorded Here Comes. Indeed, opening the album with Duke Pearson’ Tribute to Brownie (Brown had died a year earlier in a car crash) might almost be read as claim that he was ready to assume Brown’s mantle as the leading young trumpeter of the day. Smith’s sound and style have similarities to those of Brown, both young men owing much to Fats Navarro, who (like Brown) had died at the age of 26 in 1950. Smith’s tribute is fitting and powerful. He plays the opening choruses accompanied only by drums and immediately makes a strong impression; he plays rapid runs with great security and imagination. Few trumpeters can have sounded more convincing in the opening minutes of their debut recording. His blues credentials are made evident on his own ‘Brill’s Blues’, where his solo has a depth of emotional authenticity. He can play a beautiful ballad too – as he shows in a poignant reading of ‘Stardust’. He largely outplays the altoist, exotically named as ‘Buckshot’ La Funke – but in reality Cannonball Adderley masquerading under this name for contractual reasons. Smith seemed, in short, already to have all the talents in his mid-twenties – something he went on to confirm on Smithville. But recorded silence followed. He was largely forgotten as an immensely promising career dwindled away. Booker Little (b.1938) came to early prominence working with Max Roach (as Brown had done, of course). He played and recorded with Roach for two spells between 1958 and 1961, co-leading an album with Roach, Booker Little 4 and Max Roach (1958). The album reissued here is a fine example of Little’s work (one of his tempted to say ‘of his early work’, but given that he was dead a year later, it would be absurd to talk in those terms). Little plays with bell-like clarity, much of his work having a lyrically melancholy quality – striking here on an album where almost everything is taken at a moderate pace. He is ably supported by Flanagan and the prodigious bassist LaFaro (another who was to die just over a year later (aged 25), in a road accident). Like Here Comes Louis Smith, Booker Little is valuable both as a document of a promising talent left unfulfilled – for different reasons – and as an outstanding recording which merits a place in the collection of any listener interested in modern jazz. I don’t think one can make quite such a forceful claim for the two remaining albums in this compilation, though both make for rewarding and enjoyable listening. Johnny Coles is an intriguing case – his musical CV is remarkable; he seems to have worked in almost every area of jazz or jazz-influenced music and to have been in demand by major figures in the music. He seems, though, to have had little desire to cultivate his reputation outside the business, little desire for the kind of fame that would have come by making recordings as a leader – there must surely have been companies sufficiently aware of his abilities to be willing to make and issue such recordings. Of the four albums he did make as a leader the best two, in my view, are The Warm Sound (Epic, 1961) and Little Johnny C (Blue Note, 1963), although the much later album New Morning (Criss Cross, 1982) is also well worth hearing. Coles was essentially a lyricist with a warm, mellow sound and an unfailing sense of swing whatever the tempo. The Warm Sound is a good example of his qualities (incidentally the list of the personnel provided by Avid is incomplete; I have corrected it in the headnote to this review). On ‘If I Should Lose You’ and ‘Where’ he gives ballad performances of tender beauty, and Coles’ own ‘Room 3’ demonstrates his power as a blues player. Coles is a decidedly individual musician who doesn’t fit neatly into the usual stylistic pigeon holes – it is inadequate to describe him as a bop trumpeter, a hard bop trumpeter, or even a swing trumpeter. He transcends such categories – he is a jazz trumpeter and his own man. The interest of this reissued album is increased by the presence, on some tracks, of another individual stylist, the pianist Randy Weston and of three of his distinctive compositions, which Coles handles very well in his own economical fashion (he was never one to play too many notes) and with his usual fondness for the middle range of his instrument (two of the things he has in common with Miles Davis). Amongst the supporting musicians Weston solos particularly well, especially on his own compositions, and Kenny Drew’s solo on ‘Room 3’ is one of his best on record. As ever, Avid reproduce the sleeve notes of the original albums. In the case of Lookin’ Good the author’s name has been omitted, presumably by accident, so I don’t who I am quoting when I cite his/her opening words: “Joseph Henry Gordon, at thirty three, is the kind of musician to whom one is tempted to apply such slightly shop-worn adjectives as overlooked or overrated”, the clear implication being that the reader was expected to think of Gordon as among the ‘overlooked’. If that was felt to be the case in 1961, the fact that Gordon was dead before the end of 1963 makes it easy to see why he was to remain underrated. While I wouldn’t make any claims to greatness or even anticipations thereof in Gordon’s playing, he was a technically assured musician of some imagination, the equal of many better-known players. He made a first album as a leader in 1954 for EmArcy, on which he had the support of such luminaries as tenor player Charlie Rouse, pianist Junior Mance and no less a figure than Art Blakey on drums. The material was not, however, of the highest quality – all but Quincy Jones’ ‘Lady Bop’ being Gordon’s own variations on standard sequences. For this, his second and last album as a leader, the supporting cast was less distinguished, but Gordon seems to have matured as both a composer and an instrumentalist. A Bostonian by birth (he was born in 1928) Gordon worked in Boston from the late 1940s, before making his way to New York. He freelanced initially, but in 1954 he spent six months with Art Blakey (and made one recording with him). An important musical experience came when he joined Dizzy Gillespie’s Big Band on tour (in the Middle East) in 1956. His admiration for Gillespie was clear in his 1954 album and working with him only deepened his influence on Gordon’s own work. In 1958 Gordon moved to Los Angeles. All in all, this is a highly recommendable 2-CD set. There isn’t a single dud among the four albums included, and all provide lots of pleasurable listening – in some cases more than just that.